‘The Irishman’s Daughter’ is a CD that’s been in the works for a few years, and I’m so happy that it’s finished and out there in the world! It was important to me to not try to sound like a traditional artist, but like myself ~ which is a third generation Irish American with a love of the music. My choices of material for this project are either my own take on trad music or my own compositions entirely, but still with an Irish vibe to them. And, of course, none of these songs and tunes would be anything without the help of the amazing musicians who played on them! As always, a huge ‘thank you’ to you all. 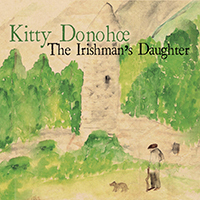 ‘Kitty Donohoe is a very talented songwriter/instrumentalist from Ann Arbor, Michigan [and] she has produced a wonderful recording with inspiration drawn from her life’s story. Simple and tasteful, always allowing for attention to be placed on the singer and the song. That is as it should be. Sing Out! And apparently ‘The Irishman’s Daughter’ is (or was in July) the #8 best-selling Irish record in Japan!